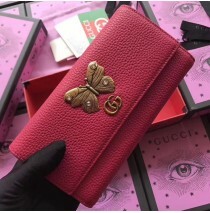 The Gucci Pink Leather continental wallet with butterfly has something which made it stand out from the crowd. As you already can see it is the butterfly which dominates on the front side. Below it is the Gucci logo, which makes the wallet look even more appealing. 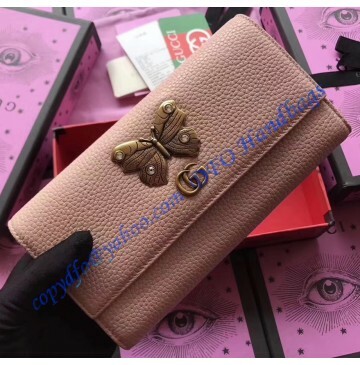 In a case you are wondering why there is a butterfly motive, you should know that it has been linked to this fashion house. 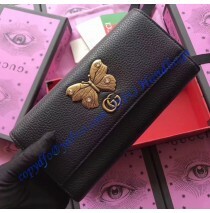 It stands for exclusivity and it has been reserved for the best and the most desirable creations made by Gucci. It is metal motive decorated with crystals and it looks and feels impressive. Of course, not everything is focused on the butterfly. The wallet is made from pink leather and it is modern and sophisticated. We liked the fact the leather is well-shaped and it looks great. The wallet will definitely be more than just appealing to all of you. It has a snap closure which makes it easier to use than other, more conventional wallets. Inside there is space for 12 credit cards and two separate, massive compartments. You also get a zipper secured pocket for coins and place for your bills. In essence, space isn’t an issue here. The wallet is originally designed for women who need big and practical wallets for everyday use. The design is still the main advantage of this wallet. Yes, it is original, special and pink leather is elegant. Regardless where you are at the moment, you will be noticed as soon as you reach out the wallet to get out your credit card or cash. In addition, this wallet is already popular in the fashion words and among celebrities, so you will have to consider it simply due to the fact it is the primary choice of those who know what they want.